Hobart Truck Spares (HTS) operates 24 hours a day, 7 days a week, for 365 days a year. When an organisation works those sort of hours, it’s a fair indication that they’re providing an essential service to the community. HTS is always on call to ensure Tasmania’s roads flow freely. They specialise in all things towing – even pungent, rolled-over fish trucks. The can-do attitude and famed customer service of the HTS crew has seen them awarded the Tasmanian Automobile Chamber of Commerce Towing Operator of the Year for the past seven years running. 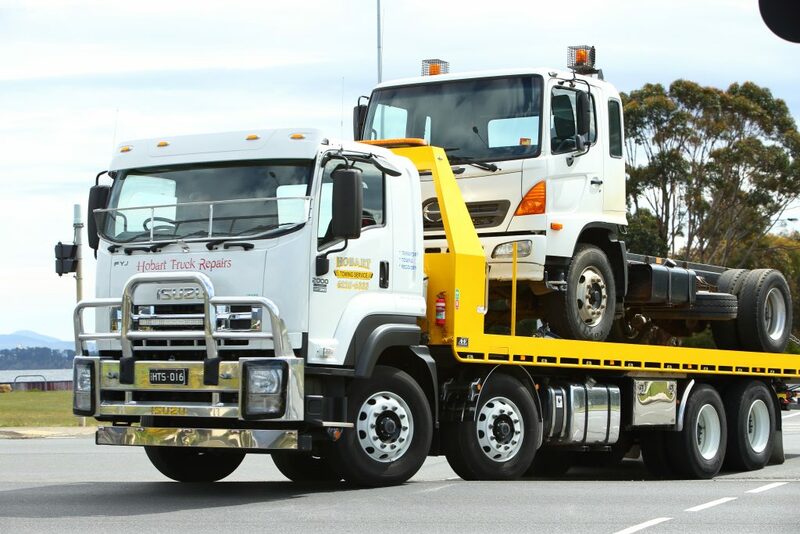 This reputation for outstanding service also helped them land the metro towing contract with the Royal Automobile Club of Tasmania (RACT), who also awarded HTS the RACT Roadside Contractor of the Year in 2017. But how has HTS’s ongoing illustrious story come to be? Their story began in 1988. Having worked a decade for the business’s previous owner, current owner, Darren Clarke, had learnt the ins and outs of the business, and decided to ply his industry knowledge as a business owner. Darren took over HTS in 1998 with a view to expand the volume and quality of their towing fleet, and position HTS as an industry premier with a distinct competitive edge. On the way to achieving that end, Darren bought his first Isuzu—an FVR 900—back in 2000, which kicked off HTS’s love affair with Isuzu Trucks. Over the past two decades HTS has purchased four more Isuzu trucks: a 2013 FVD 1000 Long tilt tray, a 2015 FYJ 2000, a 2017 FRR 110-240 Tilt tray, and a 2018 FSD 140-260 tilt tray. They also lease two Isuzu FRR 500 tilt trays from RACT, which has allowed HST to take on more work. The process of buying trucks has been made easy for Darren by the team at Webster Trucks in Hobart. Webster Trucks tailors all HTS’s trucks to the unique needs of the business, and sources the fitting of the truck bodies from Ahrns Handling Equipment in Adelaide. “We started growing and growing. Even with the four Isuzu trucks, we’re still so flat out we need to lease two more,” Darren said. HTS also has its own repair shop, so the commonality and availability of parts became a critical factor in selecting Isuzu. Isuzu parts are readily available across the country, so going with Isuzu became an even more attractive option with its practicality and sustainability. Having their transport issues solved means Darren and his team are able to focus on the core of the business. “Twenty years later and the biggest issue we have is timetabling because we are so busy,” Darren said. 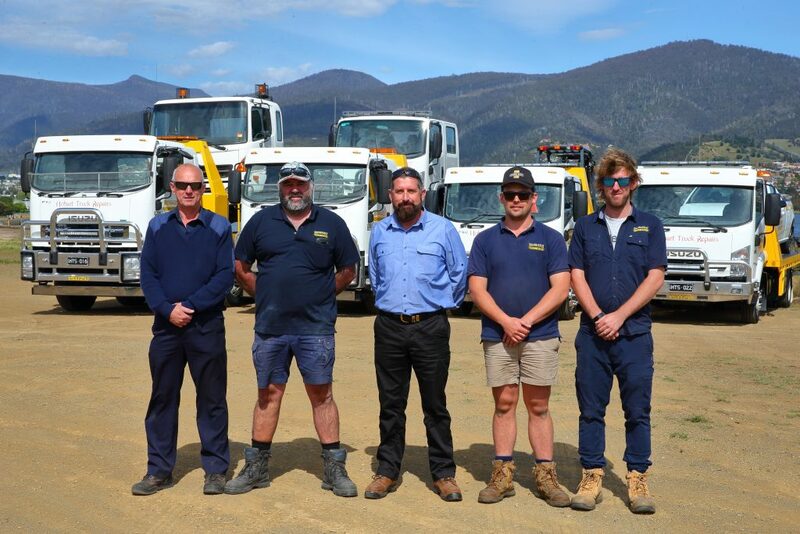 “Being a business that runs 24/7 in Tassie, we’re subject to harsh conditions, day and night; the worst is winter and that’s why we need trucks that are super reliable. “You don’t want tow trucks breaking down. That’s embarrassing, and we certainly don’t want to be towing our own tow trucks.